A) What was the Ministerio de Fomento's initial proposal ? B) How did the different stances evolve ? C) How was a final agreement reached ? 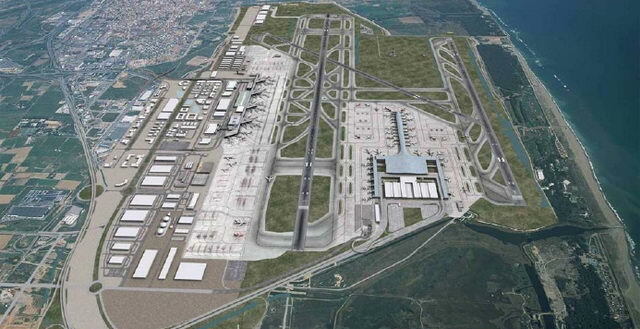 The Ministerio de Fomento was the one at the front of the line; its initial proposal was to maximize the airport's operational capacity by placing the third runway 1,500 meters away from the main runway. Given that the Catalan institutions wanted to place the runway closer to the main runway to reduce the impact on the natural reserves, the Ministerio de Fomento proposed to situate the 3rd runway 1,350 meters away from the main runway and to relocate the natural reserves to La Murtra (Gavà Mar) or to the Tordera River. The latter was rejected by ecological organization. The analysis committee's conclusions allowed for all institutions to continue defending their own proposals. As a result it was necessary to reach a political agreement to break the deadlock on the negotiations. On May 20th, 1998 the Committee for the Enforcement of the 'Pla Delta' held a meeting but was unable to come to an agreement. José María Aznar (PP), at the front of the Spanish Government, needed CiU's support to obtain absolute majority in the Spanish Parliament. If an agreement was not reached and the Ministerio de Fomento went forward with its proposal, which would directly affect the ZEPA reserves and propose its relocation, then a decision from the European Union would have to be issued. The expected decision would be against the relocation, which would mean that the whole process would start all over again while... the Barajas airport continued expanding unstoppably. On May 26th, 1998 the Minister of Fomento, Rafael Arias-Salgado (PP), took advantage of a conference in the Architect College of Barcelona to insist that the Ministerio de Fomento's proposal was the best out of all of them. On June 9th, 1998, Pere Macias (CiU), Secretary of Territorial Politics of the Autonomous Government of Catalonia, declared during the TV program 'Bon Dia Catalunya' (TV3) that 'on everybody's part there is good will, as well as from the airport and the Ministerio de Fomento' and he let it slip out that there was a pact of silence among the different administrations. To lengthen the main runway to 3,500 meters. This proposal is perfectly acceptable to the Spanish Government (PP) because it guarantees the desired operational capacity for the airport. 5. The saturation of this airport is predicted for the future. What will happen then?